The FACT and body>data>space co-curated Robots and Avatars exhibition taps into our ideas of advancing robotic technologies, and how we may expect to engage with them. Their interpretation; broadly, that it is ‘us’ in control, using them as extensions of ourselves to be put to work. The accompanying screenings juxtapose this idea, selecting a number of films playing much more on our fears than the exhibition, amongst them, Robocop (1987) and 1984’s The Terminator. A robot must protect its own existence as long as protection does not conflict with the First or Second laws. Of course, Robocop breaks all these laws throughout the course of the narrative – Ed 209, the prototype police robot, kills a gentleman at a board meeting whilst the others scatter and watch on in horror … law one broken! See what happens when you privatise the police force? Murphy, killed as a human cop in pursuit of the 80s baddies, and the replacement after the Ed 209 malfunction, rebels against his new existence when memories and emotions flood back … law two broken. At one point Murphy – a.k.a Robocop – lets the police shoot at him without trying to protect himself after trying to arrest a senior officer, which results in shutdown … law three broken! Robocop however has his own programme to follow, as a product of the police force; he must “Serve the Public Trust”, “Protect the innocent” and “Uphold the Law”. Technically, this means Robocop, unlike the I Robot laws, can harm a human being if it means protecting another one. Deceitful authorities, such as the senior officer, found a loophole within the programme allowing himself to be unharmed and untouchable, and thus free to break laws. Compass 2005 by Lawrence Malstaf is part of the main exhibition in gallery 1; a machine is worn around your waist giving you directions while you walk through virtual corridors and rooms, creating a feeling of attraction or repulsion that can be compared to being in a magnetic field. One theme in Robocop can loosely be drawn to this installation: you can choose to resist or give into the machine. 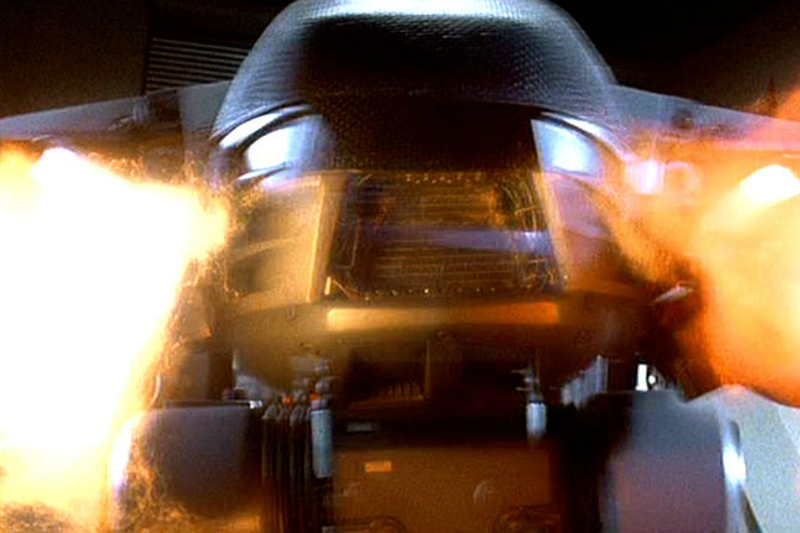 In Robocop, Murphy resists his programming and gives in to the memories of his past which spark off the emotion of revenge to those who killed him and indirectly turned him into a machine, which has been created to give in and be guided by the police and their orders. The Terminator sees everyone’s favourite action man Arnold Schwarzenegger playing a cyborg sent from the future to kill Sarah Connor. It’s obvious to see why FACT chose this film. One theme of the film is masculinity. Arnold Schwarzenegger is a stereotypical representation of masculinity and the alpha male but in terms of his character he is a cyborg; how can masculinity be truly understood by a cyborg? Apart from its programming and aesthetic, surely masculinity is something which is more fluid and symbolic – but with our world so heavily dependent on technology, could we ourselves become de-humanized – instead of building relationships through strong emotions and being physically close to someone, will technology cause our own isolation due to convenience? The Terminator taps into the battle to which people in contemporary times relate to: Man versus machine and our fears about the future. We’ve all had problems with technology be it the sat nav taking us on an adventure to never land, our blackberry crashing and deleting all our numbers leading to a status on Facebook begging for numbers, and Facebook itself being used against us and turning our fifth whiskey and coke into photographic evidence doing things we can’t even remember. Our social life has already been impacted massively through social networking sites and skype, allowing the virtual and physical spaces to blend together bringing us closer to our peers. We all know how technology can be an advantage but also a hindrance when things don’t work in practice as they do in theory. The FACT and body>data>space work together to show new innovations in our world and how artists, designers, architects, are complimented by the science fiction films putting, albeit imaginary, advanced technology into place and promoting the fear humans have that one day robots and avatars could inherit the earth.